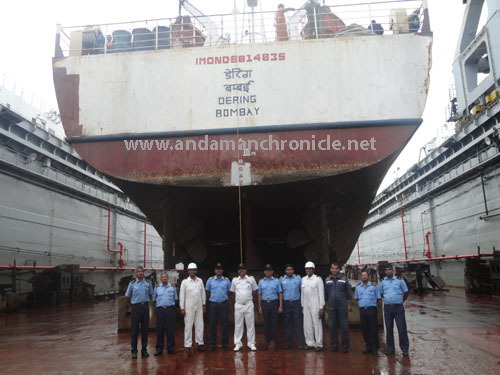 Port Blair, Oct. 14: A major milestone in the area of Civil Military Cooperation was achieved by the Andaman & Nicobar Command (ANC) on 10th Oct 13 with docking of MV Dering of Directorate of Shipping Services (DSS) on the Floating Dock of Naval Ship Repair Yard (NSRY), Port Blair. Although emergency docking of a DSS vessel was undertaken over a decade ago, this is the first docking of any merchant vessel on FDN-1 for routine maintenance. Non-military vessels are not usually docked on FDN-1, however, in a fine display of cooperation between the A&N Administration and ANC, Naval Headquarters gave go-ahead to dock vessels of A&N Administration, capacity permitting. Based on these directives, AN Cand NSRY have made available a dock slot of one month for MV Dering, accommodating the vessel after two naval ships were undocked. It was a challenging task for officers and men of FDN-1 to carry out docking of MV Dering in stormy weather conditions with associated strong winds, so that the work on the ship can be immediately commenced and available dock slot could be completely utilised by DSS. Immediately after docking, the maintenance staff employed by DSS got the first exposure to advanced high productivity tools used by Naval Ship Repair Yard. Noticing the maintenance staff employed by DSS cleaning the ship’s underwater hull using conventional manual scrapping,FDN-1 staff offered to clean the ship’s hull with high pressure water jet they usually use for quick cleaning of naval ships’ hull. The staff of FDN-1 are cleaning MV Dering’s hull with these advanced machines. The ship is expected to remain docked onboard FDN-1 for one month for intermediate survey and repairs of its underwater hull and fittings. Docking of MV Dering marks another milestone in Civil-Military Cooperation and demonstrates the strong commitment of Indian Navy and ANC in extending advanced support to the local administration and the local people.